Preschoolers love to play pretend. Now they can let their imaginations soar as they act out Bible stories with fanciful dress-ups, finger puppets, and role-plays. Dramatic play also helps little ones explore feelings and ideas in a non-threatening environment, as they learn to express themselves, act in social situations, and absorb new words and concepts. They'll master age-appropriate Christian values and concepts, too. So pull out the dress-up box, dust off your imagination, and don't be afraid to act a little silly! 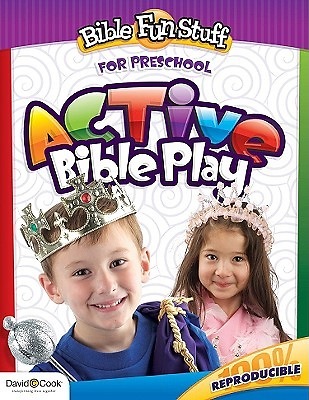 A part of the Bible FUNstuff series, Active Bible Play has twenty-six creative activities to engage kids with fantastic Bible-focused, high-energy fun! Correlated with Bible-in-Life curriculum for September 2009 through June 2010, it's loaded with innovative ideas, includes Scripture references and teacher tip, and provides a great resource for alternative Step 3 activities. This handy resource fits well with any curriculum or can be used for stand-alone activities.